When my parents asked Laura and I to stay at their house in Cedar Hills and watch my younger siblings for a few days, we were excited. Finally, we thought, we could get out of our AC-free house and cool off with modern climate control. Unfortunately, we’ve been disappointed; my parents home actually gets hotter than ours (in Provo), and if we do choose to turn on the AC it requires massive amounts of energy just to cool it down to the mid 80s. Cedar Hills—like so many recently constructed housing developments—is a disaster for many reasons, but probably one of the biggest is the community’s utter disregard for energy use. One of the biggest problems with Cedar Hills is the design of its neighborhoods. For the most part, the small community is filled with McMansion style track homes. Aside from the fact that these homes are ugly and poorly constructed, they’re also spaced just far enough apart to miss out on the (numerous) advantages of being close together. For example, though they all have pathetically small yards, none of them actually shade each other (and obviously, because they don’t share any walls, heating and cooling from one home doesn’t benefit others). The flaws in this design are painfully apparent when compared to old communities in southern Europe and the Middle East. In that part of the world many towns have narrow lanes and closely spaced structures. This design didn’t arise because the builders hated privacy or wanted quaint towns for future tourists; rather, they knew that closely-spaced buildings shade each other, thereby making them all cooler. In the centuries before AC this was especially handy, but what’s even more amazing is that many of these buildings still stay cooler than a typical McMansion with its AC running at full blast. Narrow lanes also stay cooler in the summer (and dryer in the winter) than the moronically twisting streets and superfluous culs-de-sac common in American suburbs. Related to the macro-community issues in Cedar Hills, each structure experiences an array of individual problems. For example, even if something was shading my parents’ home, its floor plan would still make cooling nearly impossible. The home has three floors and each one is always a drastically different temperature because there is almost no airflow. This means that to get the ground floor comfortable the basement ends up being cold but the upstairs is still too warm. If this problem was confined to my parents’ home it wouldn’t be much of an issue. Instead however, vast numbers of relatively new homes are inefficient energy hogs. In turn, they cost their owners more money and negatively impact the environment. The American dream seems to include an almost obsessive drive to own a home. Unfortunately, this drive has produced communities with long-term energy consumption problems (in addition to simply being eyesores). Hopefully the contraction of the housing market will force developers to reconsider building cheap, environmentally unsound homes. A few nights ago Laura and I got dinner with some friends at Guru’s. It had been quite a while since I’d eaten at Guru’s so I was excited to try it out again. For the sake of experimentation, on this visit I ordered the Pan Seared Salmon Bowl. It was good. Not great, but good. Appropriately, the salmon was the highlight of the dish but unfortunately everything else didn’t quite measure up. The vegetables, for example, were acceptable, but bland. I also went with brown rice, which, to my great disappointment, apparently meant white rice that was faintly brown. Note: the words “brown” and “white,” when describing rice, as supposed to indicate distinct flavors and textures. Still, I enjoyed my meal. It wasn’t good enough on its own to bring me back, but if (or when) I find myself at Guru’s again I won’t completely rule out an encore. If Guru’s food isn’t enough to make a repeat customer out of me, the ambiance is. To be honest, the décor of the restaurant has always bugged me, so I was surprised to find myself liking it so much this time. In the past I’ve felt like everything was loud and trying just a little too hard to be hip. I also questioned the tastefulness of the large Gandhi wallpaper in the corner. (Sure, its called “Guru’s,” which might imply some sort of India connection, but is it really appropriate to use Gandhi’s image to sell burritos?) This time however, the lighting was much lower, deemphasizing some of the venue’s incongruities. As an added bonus a jazz band was performing while we ate, which (to my pleasant surprise) radically altered the atmosphere, making it feel far more urban than anywhere else I’ve been lately in Utah County (yes, including Spark). 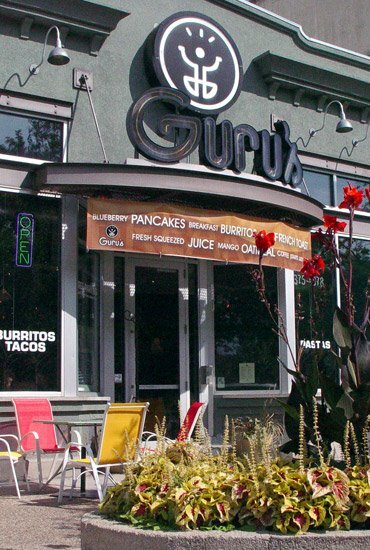 If none of these changes are wholly original (even in a city like Salt Lake the bar might be terminally higher for a restaurant like Guru’s), they also helped the restaurant stand out in an area dominated by chains and family restaurants (like Brick Oven). Guru’s is well worth a visit. The food isn’t the best in the world (or even in Provo), but the experience is unique and unrivaled by other local eateries. Between the menu and the décor Guru’s has managed to attract both the hip(ster) and mainstream crowds, and (to my surprise) I’m looking forward to my next visit. From time to time on this blog I’ve reviewed local restaurants. I hope to keep up that trend but right now I’d like to look at the operative word in that first sentence: local. By and large I believe that, if you have the choice, it’s better to eat at a local restaurant. There’s a few reasons I believe this. First, there is the distinct possibility that the food will be better at a local place, and if it’s not it will still probably be unique. If you want a sandwich, for example, and decide to go to Subway, you know what you’re going to get. On the other hand, a local sandwich shop has the freedom to experiment with its menu and try new things. Those experiements may be delicious, but even if they aren’t better than Subway (which by the way isn’t bad), they’ll offer a one-of-a-kind eating experience. This idea seems to apply across the board; whether its local Italian verses The Olive Garden and Macaroni Grill, or the neighborhood diner verses McDonalds, Carl’s Jr., etc., my experience is that in each case the smarter culinary choice is to avoid the chains. Besides the potential for better food, local restaurants almost always have a better environment. I always laugh/cringe when I walk into a Chili’s, Applebees, Red Robin, TGIFridays, take-your-pick-of-generic-Americana; they all look exactly the same (both from location to location, as well as from company to company). I remember ending up at one of these restaurants on my first visit to New York and wondering why it would be decorated exactly the same there as it was on the West Coast. How can there be so many restaurants filling the same bland niche? (Of course, the food at these places isn’t necessarily bad, they just tend to offer so much less in the way of environment than most local places. Also, the food at these restaurants isn’t particularly memorable.) Local restaurants, however, often have quirky environments that, if varying in their success at creating a desired ambiance, are usually much more stimulating than the props chosen by corporate headquarters to decorate chain restaurants. My point here isn’t to argue for the complete elimination of chain restaurants but rather to suggest that when considering where to eat, thinking local should be the first response. Obviously there will be times when availability, price, or (bafflingly) even taste will lead people to choose chain restaurants. Also, most chain restaurants probably started out as local businesses and hopefully retain some of the spirit from their earlier days. Still, local eateries provide an experience that larger chains can only meagerly and unsuccessfully imitate. What’s more, eating local pumps more money into the community, which of course means more growth, opportunity, and progress locally. Whether or not you believe in the “buy local” movements sweeping across the nation (and the world), eating at local restaurants is a way to have a rewarding culinary experience while supporting people who are probably your neighbors. I know that the next time I go out, I’ll be walking down the street to find a place instead of driving to the nearest chain.